Good Samaritan Sister Margaret Smith participated in a month-long liturgical study tour to Europe last November. A constant message throughout the tour was “we can’t go back”. 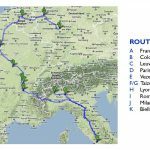 In November 2011, I was one of a team of four lecturers from Yarra Theological Union (YTU), Melbourne, which led a month-long liturgical study tour to Europe. The tour, entitled “Realising the Vision: 150 Years of Liturgical Renewal”, was offered to YTU students and to anyone who had an interest in contemporary liturgical renewal. 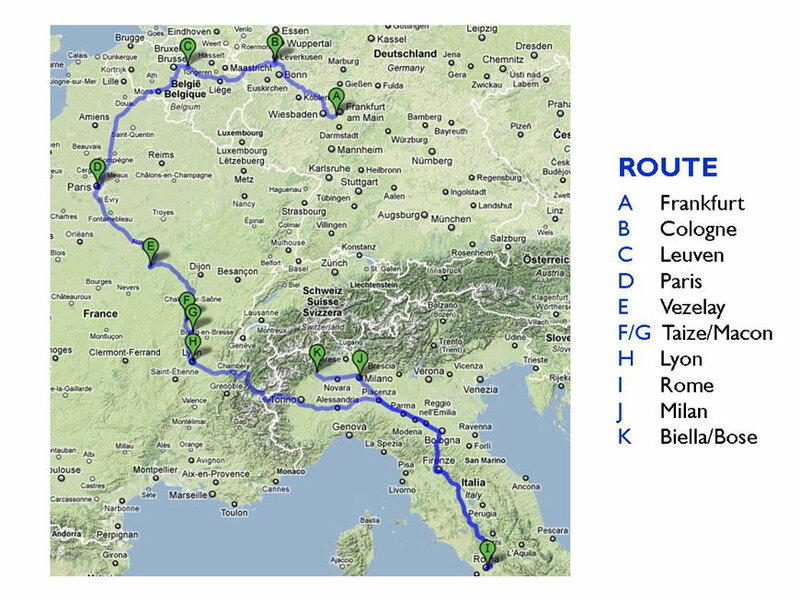 With 25 participants from several Australian dioceses, we set out for Germany, Belgium, France and Italy, ready to face the beginning of a European winter. 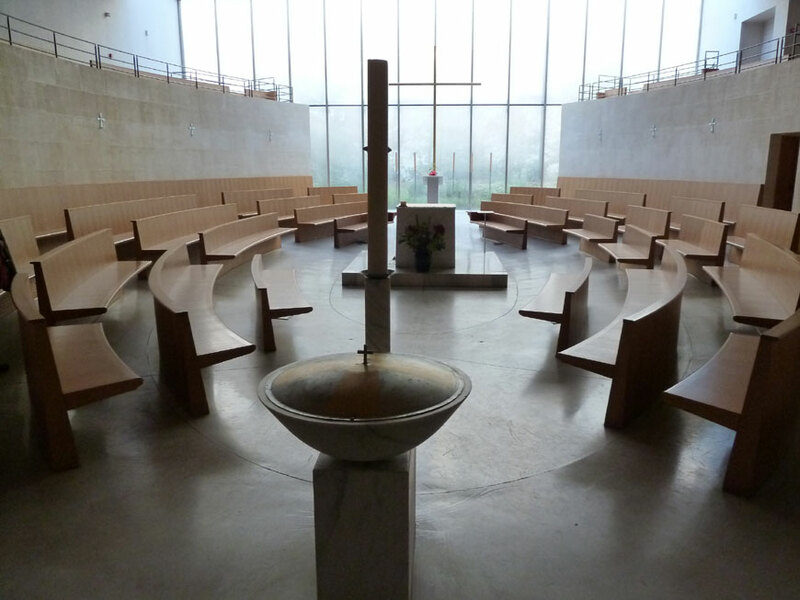 The aim of the tour was to expose participants to several of the key Catholic and ecumenical centres in Europe that gave birth to the Liturgical Movement and which inspired Vatican II’s charter of liturgical renewal, and also places where the liturgical vision was still being realised and given different expressions. 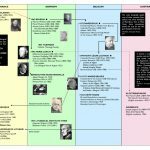 Why, at this time, did we embark on such a quest, almost 50 years after the Council and over 100 years since the pivotal event of 1909 when the young Benedictine monk, Dom Lambert Beauduin from Mont César Abbey in Belgium, delivered an address on “The True Prayer of the Church” at a national congress? Although it is recognised that there was an earlier stage of the liturgical movement in the nineteenth century through the reform efforts of Dom Prosper Guéranger at the Benedictine Abbey of Solesmes in France, this 1909 event, according to many historians, inaugurated a new era for the liturgical movement and set its agenda. Exciting and heady years followed the promulgation of the Constitution on the Sacred Liturgy in 1963. We saw the presider facing the people, a vernacular liturgy, a richer fare of Sacred Scripture in the Sunday liturgy, preaching based on the scriptures, the baptised laity exercising liturgical ministries, and so much more. But, nearly 50 years later, we are a Church from which many are walking away, and only 12 per cent of which regularly celebrate Sunday Mass. With a new translation of the Mass that seems to prize literalism over inculturation and the language of the people, a hugely attended Third Rite of Reconciliation withdrawn from practice, and various agendas calling for “reforming the reform” or “restoring the pre-conciliar”, could there be no better time to visit places which were the inspiration of the liturgical movement, and places giving new hope through the implementation of that vision? 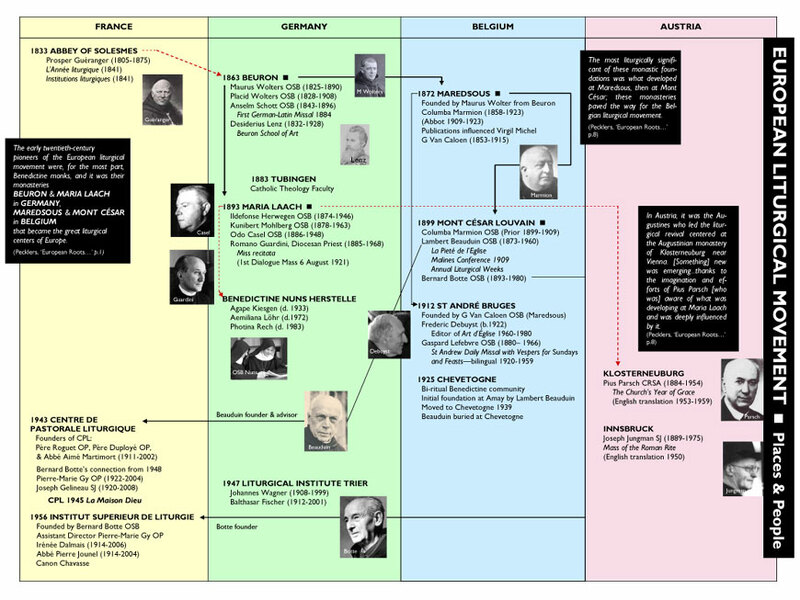 A number of abbeys in Germany and Belgium were founded either directly or indirectly from Solesmes. 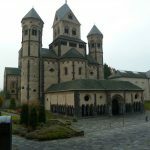 We visited three of these: Maria Laach in Germany; and in Belgium, Mont César (now Keizersberg Abbey) and the Abbey of Clerlande. At Maria Laach, located in the Rhineland, we stood in the small crypt where, early one morning in 1921, the first dialogue Mass was celebrated – the presider faced the people, the assembly prayed the common parts of the Mass together, and members of the community brought up the gifts during the offertory procession. 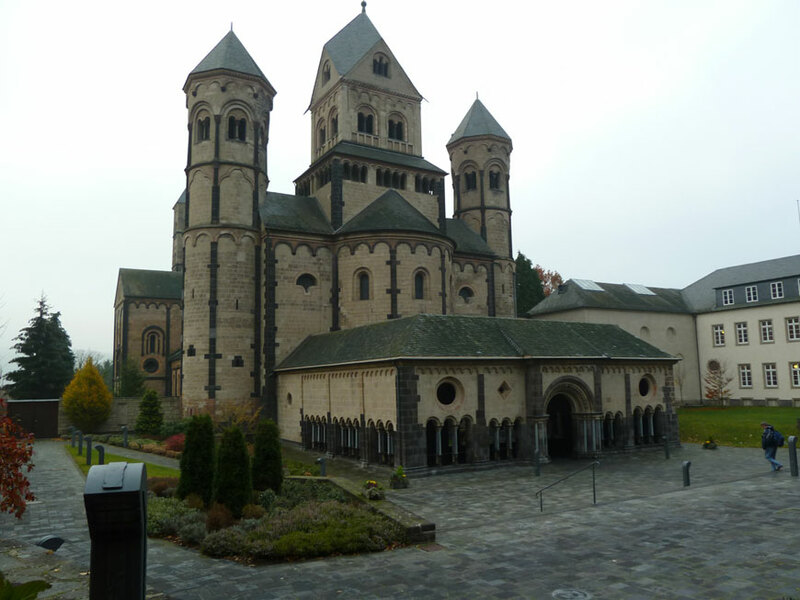 How moving it was to be in this place, Maria Laach, which, through its scholars and publications became such a stronghold of liturgical developments in Germany. 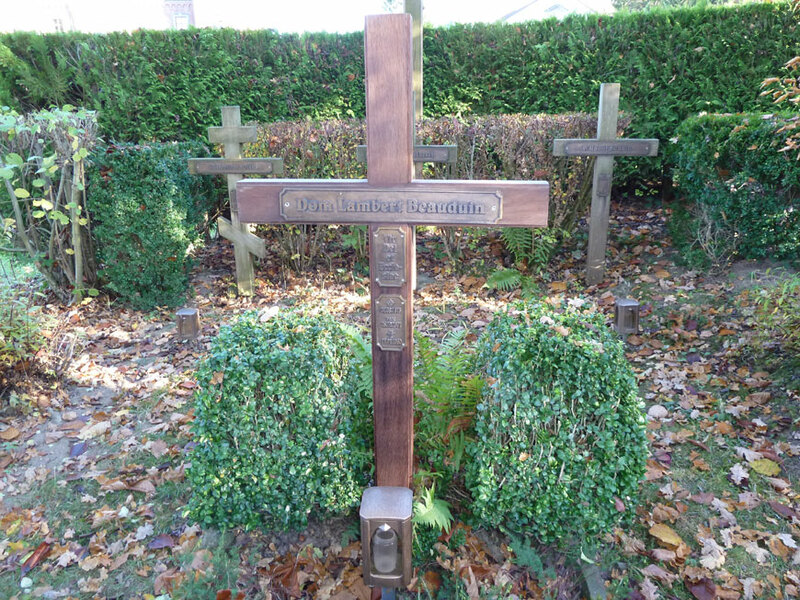 Then there was Mont César in Belgium where we met old Father Guibert with one of the young professors of the Catholic University of Leuven, Professor Joris Geldhof, respectfully at his side. It seemed that even the abbey’s walls were steeped with the energy of its pioneers. 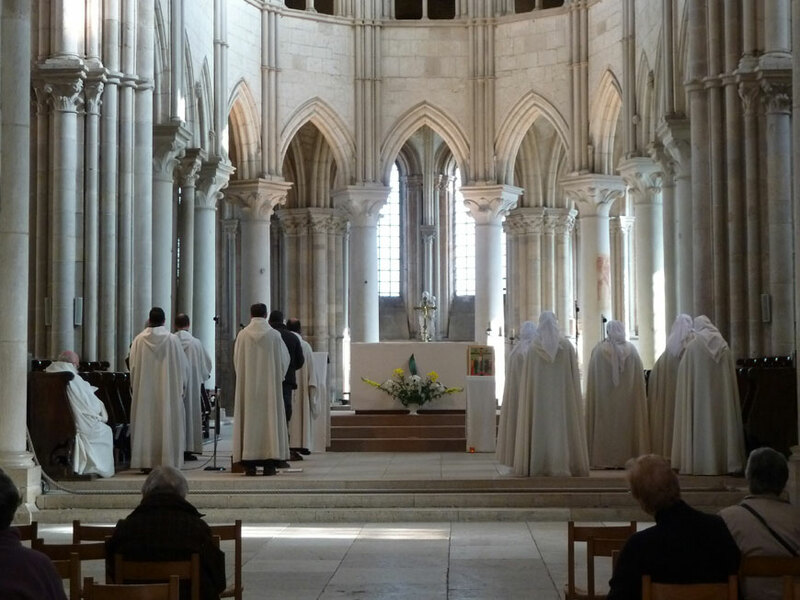 It is said that the young Beauduin burst into one of its classrooms one day exploding: “I’ve just realised that the liturgy is the centre of the piety of the Church”. In a towering library, smelling of old manuscripts and prized books, Dom Guibert had laid out for us some of the early writings and journals of the liturgical movement. 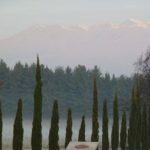 He spoke excitedly of his memories, especially of Beauduin and another pioneer, Dom Bernard Botte, as Professor Geldhof patiently translated. At the Abbey of Clerlande we met Dom Frederic Debuyst, another old man of the days of Vatican II who, in 1960, as its editor began the journal Art d’Église which was to last 53 years. 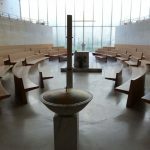 Speaking in the simple, ‘human-scale’ monastery chapel which he designed, his rheumy eyes sparkled as he relived the excitement and hope of the early days of the renewal that came in the wake of the Council. It was a privilege to meet these old monks, who hold the story of the part that earlier monks or they themselves played, in realising the liturgical vision of Vatican II. It was inspiring to see them still full of hope. 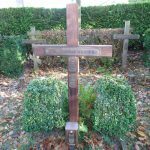 It was at the bi-ritual abbey of Chevetogne, also in Belgium that we stood beside the grave of Dom Lambert Beauduin who had generated such hope. Later, while in Rome, Archbishop Piero Marini, the Papal Master of Ceremonies for many years, welcomed us at his Vatican office and encouraged us to live with similar hope, as did those giants who had gone before us. Liturgical experiences were a highlight. One, in particular was Sunday Eucharist at St Theodor’s in Cologne. This parish is situated in a very poor area of the city and has a 40 per cent rate of unemployment. The church building includes not only an assembly space but also an extensive ground floor level where outreach to the poor takes place. There was a bicycle room, a clothing shop, a hall for food outreach, another room for carpentry. For this community, worship and outreach go hand in hand – a powerful experience of the connection of the liturgy to social justice. This was also the case with the Sant’Egidio community, founded in Rome in 1968 by a high school student, Andrea Ricardi. Inspired by Vatican II, the Sant’Egidio community is now an officially recognised lay association with some 50,000 members in over 35 countries. Its life is characterised largely by solidarity with and voluntary service to the poor, as well as by commitment to ecumenism and inter-faith dialogue, and involvement in global peace negotiations. The need to pray together inspired especially by listening to and reflecting on the Word of God, is at the heart of the community’s life. Although they do not live together, they gather daily to pray Evening Prayer to which many are welcomed. We celebrated Sunday Eucharist with the Sant’Egidio community and experienced the warmth of its hospitality. 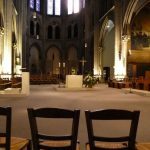 In Paris we celebrated Eucharist at Eglise St-Ignace. This reordered Gothic church is in an arcade of boutiques; it is a place of quiet in the midst of a bustling commercial life. 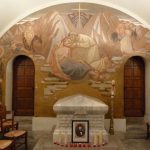 For liturgists, St Ignace is full of significance, having been for many years, the parish where Joseph Gelineau celebrated liturgy and from where, with his compositions, he exerted such international influence on liturgical music. 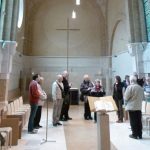 It was also where Jacques Berthier, the resident organist was invited to compose for the special needs of the Taizé community. The animateur at this Eucharist, leading both the choir and the assembly, was an effective model of graceful liturgical music ministry. On the Feast of Christ the King we celebrated Eucharist in Rome at the Oratory of St Francis Xavier del Caravita, a reordered seventeenth century Baroque church not far from the Trevi Fountain. The pastoral staff includes Father Keith Pecklers SJ and other confreres from the Pontifical Liturgical Institute of Sant’Anselmo. This is a church where English-speaking Catholics in Rome can experience Sunday liturgy at its best. Good preaching, excellent music and full participation is assured. The community at del Caravita has established strong bonds with the nearby Anglican Centre where Canon David Richardson, formerly Dean of St Paul’s Cathedral in Melbourne, is now the Archbishop of Canterbury’s Representative to the Holy See. 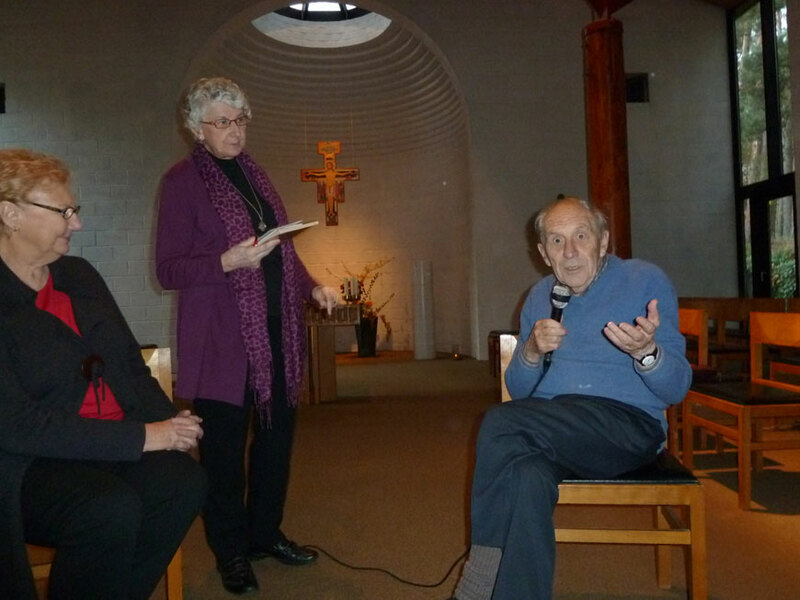 We experienced the warm hospitality of Canon David and his wife Margie when we visited the Anglican Centre. We also attended Ecumenical Evening Prayer and an Anglican Eucharist both held at del Caravita. In a number of monasteries we experienced different expressions of the Liturgy of the Hours and, for many tour participants it was a surprise to learn that that this prayer, so central to the lives of these communities, is part of the official liturgy of the Church. This discovery raised the question of the place of the Liturgy of the Hours in the life of the whole Church. It was heartening to see a group of young students who daily organise Midday Prayer in the cathedral at Bonn. We prayed the Liturgy of the Hours with three Jerusalem communities. The Jerusalem Community was founded in Paris in 1975 by Pierre-Marie Delfieus. His aim was to promote the spirit of the monastic desert in the heart of cities. Some members undertake outside work but all contribute to their beautifully sung, simple and dignified Offices and communal life. Jerusalem communities pray the Liturgy of the Hours daily and many people join them particularly at evening. 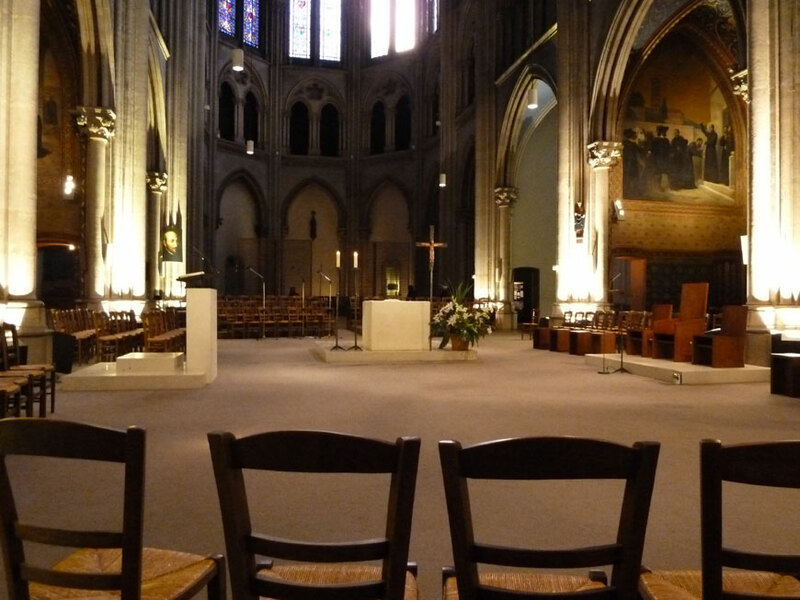 Our first experience was in St Martin’s at one of the 12 restored Romanesque churches that ring the city of Cologne. 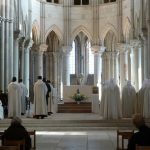 Another experience was at the Basilica of St Mary Magdalen in the medieval town of Vézelay in the Burgundy region of France. The singing of the Offices in these communities had a mystical character and echoes of the rich Byzantine harmonies. 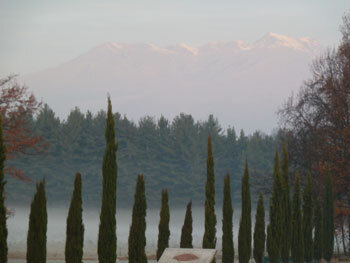 And then there was Taizé – late at night and in dense winter fog! We are so familiar with their chants. 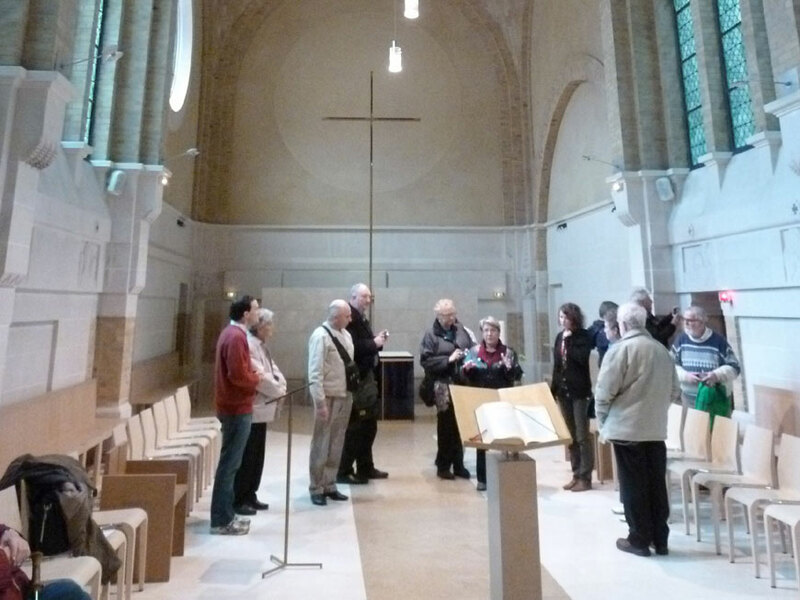 Another important aspect of the tour was the visits to churches of architectural interest. It was overwhelming to have a guided tour of the Cologne Cathedral at night. Imagine being asked to lie on the floor in front of the altar as the cathedral was gradually darkened. From this perspective, we were able to view the soaring cruciform ceiling of this vast gothic ediface. 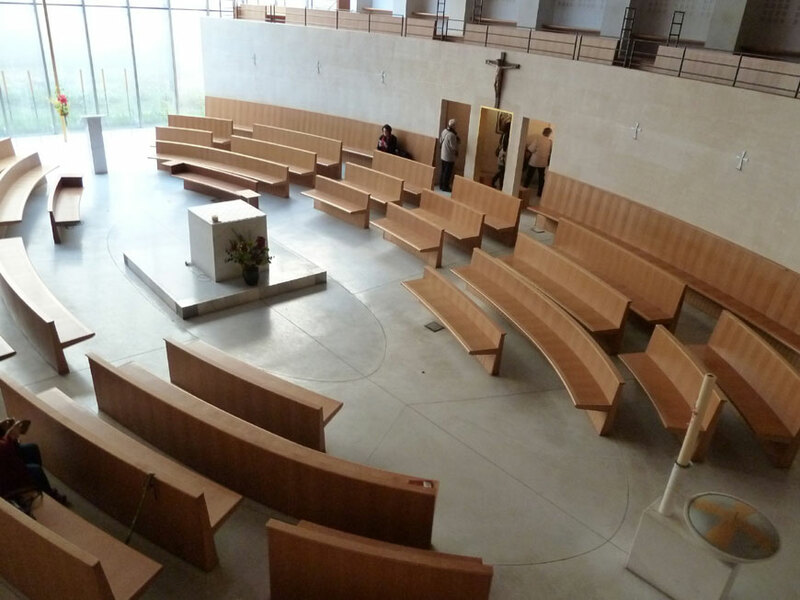 Paris also provided the opportunity to visit several striking contemporary churches, built in recent years for the post-Vatican II liturgy. 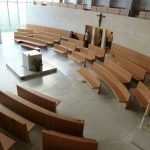 These churches, quite modest in size, are located right in the heart of business districts and function as places of quiet and centres for weekday Mass, amid a busy commercial life. 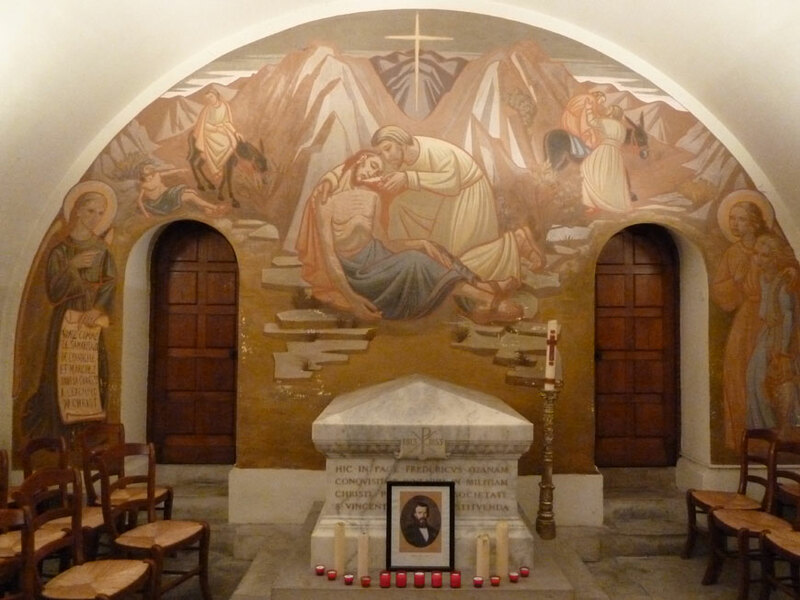 A highlight was a visit to the chapel of St Francis de Sales, the worship space for the French Bishops’ Conference. This chapel has been boldly reordered, honouring the simplicity and exquisite lines of the Romanesque. 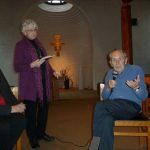 Since this was a study tour, we visited Liturgical Institutes in Bonn, Leuven, Paris and Rome, in each of which there were presentations by professors who are involved in “realising the vision” through educating students in liturgy. These scholars Albert Gerhards, Joris Geldhof, Herman Lombaerts FSC, Patrick Prêtot OSB, Keith Pecklers SJ, Mark Francis SCV had prepared thoroughly for our visit and their input was highly stimulating and challenging. In speaking of the liturgy, a constant message was “we can’t go back”. As a culmination we rounded off the tour with some restful and prayerful days, sharing in the life of the Bose community in Italy. This ecumenical, lay monastery of women and men was founded on the day Vatican II ended by a young economics student from Turin, Enzo Bianchi. There are now 80 plus members in the community, and the average age is 42! Everything about Bose spoke of beauty, care and attention. The community’s way of life is simple, combining prayer and work – cultivation of fields and gardens, ceramics, icon painting, carpentry, publishing, printing. They pray morning, midday and evening prayer and celebrate Eucharist on Sundays and Thursdays. Every day at 5:00 pm the brothers and sisters engage in lectio divina, all using the Gospel reading for the following day. The beauty and the atmosphere here and the life of the community were a powerful experience that was a fitting end to a remarkable liturgical tour. 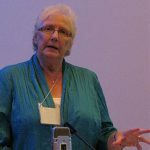 Good Samaritan Sister Margaret Smith is an author, educator and liturgy consultant. She holds a Doctor of Ministry in Liturgical Studies and currently teaches units in liturgical studies at Yarra Theological Union, Melbourne.